Aiseesoft iRiver Video Converter can also convert audio files including MP3, MP2, AAC, AC3, WAV, MID, MIDI, WMA, M4A, RA, RAM to iPod MP3, M4A, AAC to MP3, WMA audio formats. Aiseesoft iRiver Video Converter has powerful effect editing functions ofâ€œTrimâ€, â€œCropâ€ and â€œMergeâ€. You can easily cut any clip of your video, crop the black edge of the video, merge several videos into one file. 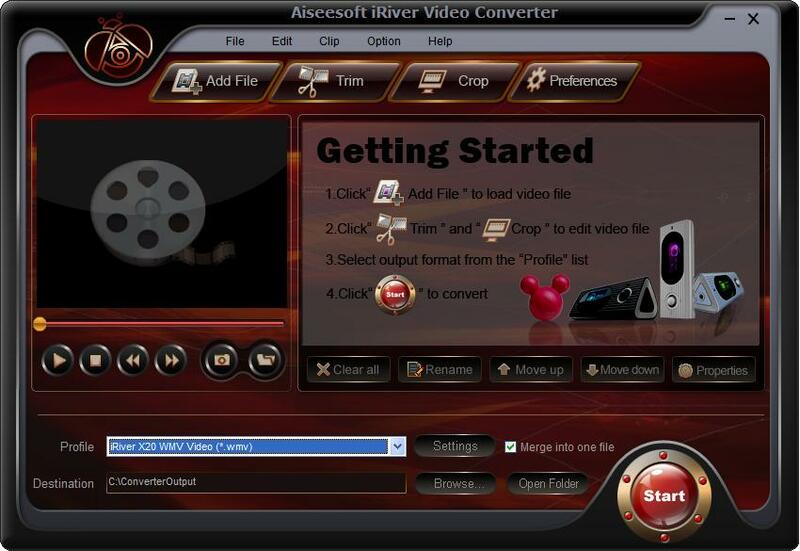 Aiseesoft iRiver Video Converter software provides an easy way to combine and join multiple videostogether with most video formats supported, such as AVI, MPEG, WMV, MP4, DivX, MOV, 3GP, ASF, etc. Just select the videos you want to join and check the â€œmerge into one fileâ€ check box you can finish it easily. Aiseesoft iRiver Video Converter software provides â€œTrimâ€ function to help you cut any clip from the original video. You can set the â€œStart Timeâ€ and â€œEnd Timeâ€ of the clip you want to get or just drag the slide bar to the accurate position to achieve it. If you like the current image of thevideo you can use the â€œSnapshotâ€ option. Just click the â€œSnapshotâ€ button the image will be saved and you can click the â€œOpenâ€ button next to â€œSnapshotâ€ button to open your picture.